Actvity Summary: Students use CORK data to investigate the causes, effects, and relationships between fluid pressure measurements at the seafloor and the oceanic crust below. 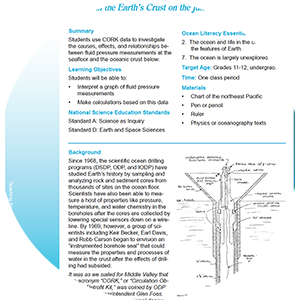 Since 1968, the scientific ocean drilling programs (DSDP, ODP, and IODP) have studied Earth’s history by sampling and analyzing rock and sediment cores from thousands of sites on the ocean floor. Scientists have also been able to measure a host of properties like pressure, temperature, and water chemistry in the boreholes after the cores are collected by lowering special sensors down on a wireline. By 1989, however, a group of scientists including Keir Becker, Earl Davis, and Robb Carson began to envision an “instrumented borehole seal” that could measure the properties and processes of water in the crust after the effects of drilling had subsided. Several sites on the Juan de Fuca Ridge axis and flanks have now been drilled and sealed by CORKS equipped with long-term pressure and other data collecting instruments. In September 2007, a party of about a dozen scientists, graduate students, and teachers from the United States and Canada traveled aboard RV Atlantis to the sites where they recovered long-term data, installed new equipment, and serviced CORK observatories. Alison LaBonte descended to the seafloor in DSV Alvin to download pressure data directly from the instruments at Site 1027C.